John Derrig’s home is his laboratory and his family the guinea pigs. They all take a heating so he can test fabrics the hard way. DOROTHY Derrig was coming down the walk in front of her house at Bound Brook, N. J., in an exquisite sheer-net party dress. Suddenly her husband John whipped around the corner with the garden hose, like a fireman who had overslept a three-alarmer. He squirted the full spray on his pretty wife and soaked that long, lovely gown from neck to hemline. John beamed and turned off the jet from the hose nozzle. Then they strolled happily around the house to spray some net curtains hanging on the wash line. The neighbors still stare at such strange goings-on at the Derrig home. Luckily for John, though, they don’t call a cop or the Humane Society when they see him turning the hose on his wife or slinging mud at his kids. 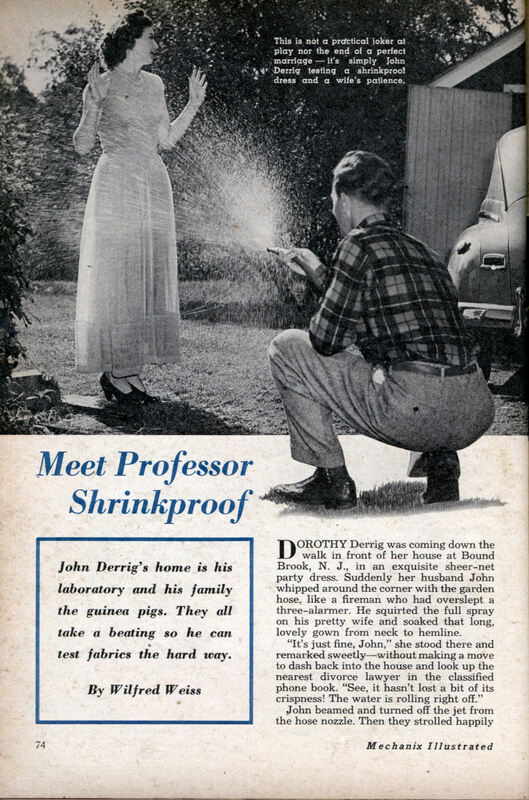 For the people next door know now that he’s “Professor Shrinkproof,” a respectable citizen who is merely trying out the results of his chemical research in fabrics for the American Cyanamid Company through practical “consumer” tests to see how some new product takes rough wear. Almost every day his family serves as guinea pigs for the Professor’s fabric ideas â€”but they never rebel against this peculiar homework and are as eager as the Professor to find out how the product stands up after they put it through the wringer in these home-lab experiments. In drenching his wife, John was testing something known as Sheerset finish for rayon, nylon and cotton net cloths. It got its start during World War II when the Army was looking for a way to make mosquito netting easy to dye but resistant to moisture and mildew and to keep it from turning into a soggy mess when it was washed. Sheerset finish is the answer. It takes dye easily and stays crisp despite moisture. Also, the strands don’t slip and bunch up during laundering. You can toss Sheerset curtains into the washer, for instance, then dry them on the line without using a stretcher. They’ll dry evenly with no shrinking or sagging. Professor Shrinkproof’s wife accepts her guinea-pig role with understanding and good grace. And his two children, Diane, six, and Johnny, two, take it all with great glee. They believe they have the most unusual father in the world. Where else would you find a parent who has his son dressed in a fresh cotton suit and encourages him to flop down and scrape along the sidewalk? To young Johnny, that’s great fun. He’s probably the only kid in America who gets an ice cream cone for wearing a hole in the seat of his pants. To the elder John, it’s a scientific observation of the effect on cotton of a process called Permel finish. After proving that Johnny’s pants resisted a thorough scraping on the sidewalk, he could report back to Cyanamid that Permel positively did not reduce the resistance of cotton cloth to abrasion. Permel, like Sheerset a resinous finish, is designed to make cotton cloth water repellent. There have been water repellents before, but they reduced the tensile strength and the resistance to abrasion and never lasted long. You can wash or dry-clean a Permel-treated garment without affecting the finish in any way. Permel undoubtedly is Johnny’s and Diane’s favorite. In testing it at home, their father had little trouble persuading them to spill tomato juice on the Permel-finished couch slip cover and splatter mud over each other’s clean Permel clothes. While they were testing Permel, Johnny and Diane had a wonderful time playing in the mud in the backyard. After they had splattered each other thoroughly, Dorothy wiped them off with a damp rag and they looked as fresh as new. John reported back to the laboratory that he had confirmed the lab experiments: Permel is proof against any stain soluble in water. Such fancy antics as these unusual home tests make Johnny and Diane the envy of all the other kids in the neighborhood. When they play house, for example, and pretend they’re going on a trip, they don’t have to make shift with old rags to pack in their small toy suitcase. They can have one of their mother’s freshly laundered cotton dresses or one of their father’s cord suits to fold and crumple. While they think they are having a wonderful time, actually they are performing the definitive test for something called Superset, a crease-resistant finish for cotton. Superset added to Professor Shrinkproof’s local reputation as an eccentric. For a while, he seemed to be wearing a pair of cotton slacks with one leg pressed and one leg unpressed. However, it was very logicalâ€”when he explained it. One leg of the slacks was Superset-treated, the other untreated. It was an ideal way to make a comparative observation of the treatment in action. As a result of this test, this summer you will be able to buy cord or other cotton suits that you can wear a couple of weeks without their looking as if the suit had been designed as a dust cover for an accordion. Just as often as the Derrig children are the envy of the neighborhood youngsters, they are the despair of the neighborhood parents. While he was working on Permel, John wanted to test for another property; he started washing the car with a pair of treated overalls. When Diane came up, he invited her to turn the garden hose on him while he thoughtfully pirouetted about under the spray. Finally he was satisfied that Permel made the overalls water resistant. A couple of neighbors’ children, noting this shennanigan, were equally inspiredâ€”if not scientifically preparedâ€”when they turned the garden hose on their parent. The result was literally a washout. That irate parent probably will never see the humor of the situation. He was referring to an early spring dunking he gave himself while wearing a plaid wool jacket, to try out a process that makes wool water repellent. Anyone who has ever worn woolen socks knows that, no matter how careful you are in washing them, eventually they shrink to baby size and become so tightly knit that they feel like the felt in your hat. With this process you can wash a woolen blanket or tweed suit with no ill effects. I just stumbled onto your site. My grandfather was ‘Dr. Shinkproof’ and my father young Johnny. 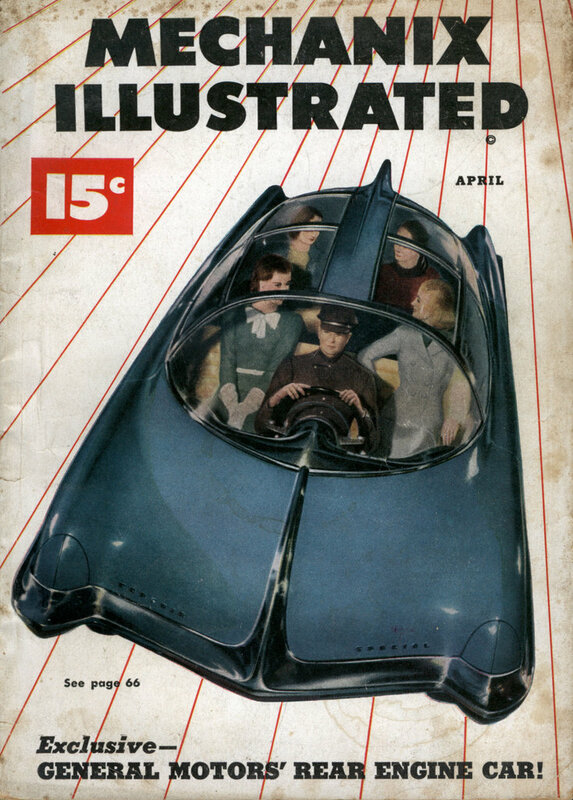 I enjoyed the article and have several copies of photographs just like these that were taken for a similar piece in LIFE magazine around mid-century. Thanks!